Facebook said that it was rolling out a new Timeline in the coming weeks for users, which sets us up perfectly for the new News Feed whenever that’s going to be released. 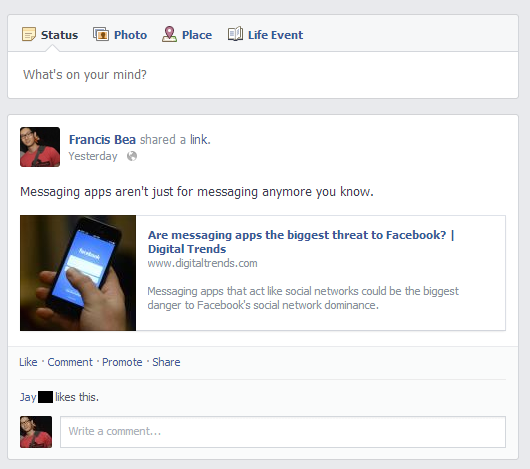 We’ve noticed that Facebook was toying around with the Timeline in the past week. The in-line navigation that we’ve expected to see for some time now suddenly appeared without changes to the timeline layout and disappeared the day after. 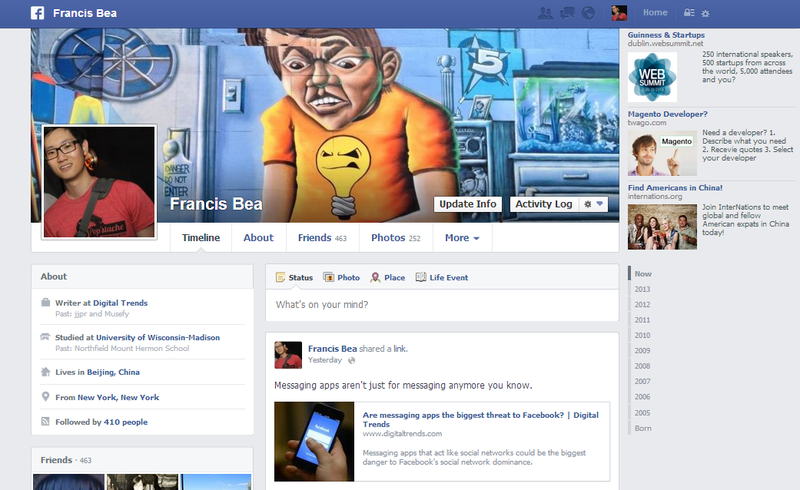 Well this time the new Timeline design we think is here to stay. Since we’ve got our first look at the new Timeline, which sports some significant changes, some expected, some not, we figured we’d give you the run down on what to expect and how it works. There’s a lot to take in here. The structure of where modules are laid out has been flipped around; your status updates and posts are now on the right side in a single column. Yes, the staggered Timeline design has been thrown out for good. All modules including the “About” section, a list of your friends, photos, places you’ve been, movies, and Likes now sit on the left side. What was on the left is now on the right and vice versa. Why? Likely because we naturally read (most of us in the West anyway) from left-to-right, we’ll now be more likely to read the content on the left, which is what Facebook really wants visitors and users to pay attention to. The navigation section, as expected, has removed the navigation tiles that once sat at the top of your Timeline, right below the cover photo, and opted for a cleaner and easier to navigate text-based navigation tabs. The tiles once held media like music, movies, TV shows, books, notes, but now these sit on the left side of the page, along with a new dedicated Instagram module. If you haven’t filled anyone of modules yet with content, the empty box with the bolded “+ Add Movies You Watched” call to action might bug you enough to fill that part in. We noticed that this design is really about getting users to open up about their interests, since these types of content would have been hidden from view in the previous version. With this in mind “Recent Activity” has been pushed all the way to the bottom since it’s now not really something Facebook cares too much about as there’s little content for your friends to engage with there. The look and feel of the new Timeline is a lot cleaner. 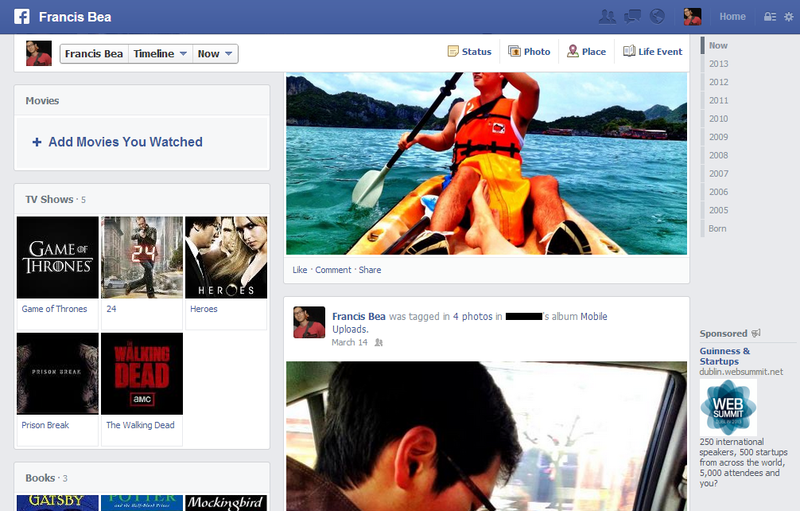 Facebook has opted for a clean, all-white look that won’t distract the eyes from the content. In the previous Timeline, the in-line Like, Comment, Share buttons sat inside of a blue-hued rectangle, but that’s been removed. Even the iconic thumbs up Facebook “like” icon are nowhere to be seen. The “Write a comment” box no longer sticks out like a sore thumb, even though it now has the user’s profile picture next to the box. Photos, Open Graph posts, and even shared articles all stretch to the very edges of the status update box. The Photos, Friends, and Places sections have been organized in a way that makes navigating between the content much easier since all the tabs you need are presented inline. 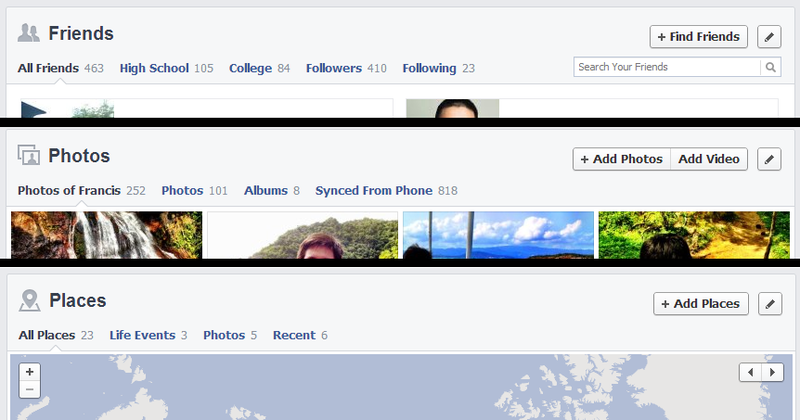 You can check out the screen shot of the inline navigation, which was the major change to these three sections, above. These actions are tied to collections of media, meaning that the social network suggests books, movies, and other media that you can pick out from a list of recommended titles so these collections can show up on your Timeline (and News Feed). 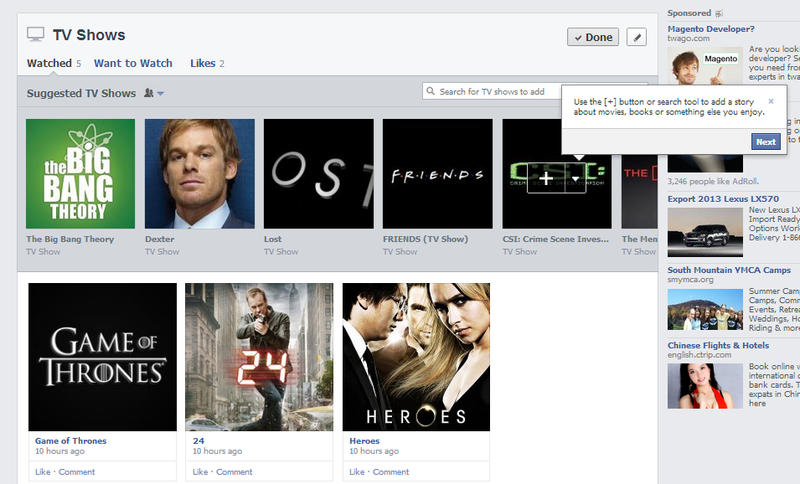 You can add TV shows that you’ve watched before. To do this you’ll either need to search for shows that you want to add to the “Watched” collection via the inline search bar, or you’ll have to cherry pick it from the left-to-right scrollable section of TV show titles with cover art titled “Suggested TV Shows.” The same goes for the “Want to Watch” collection. This applies to the books, movies, and TV sections. The music section works similarly, but with a slight difference. It shows you the music you’ve liked so far or you can select music you’d like to “Listen Later.” For either options, you can scroll through “Suggested Music” and add these to your collection. If you click on these titles, you can listen to the tracks from the artists via Spotify’s desktop app. 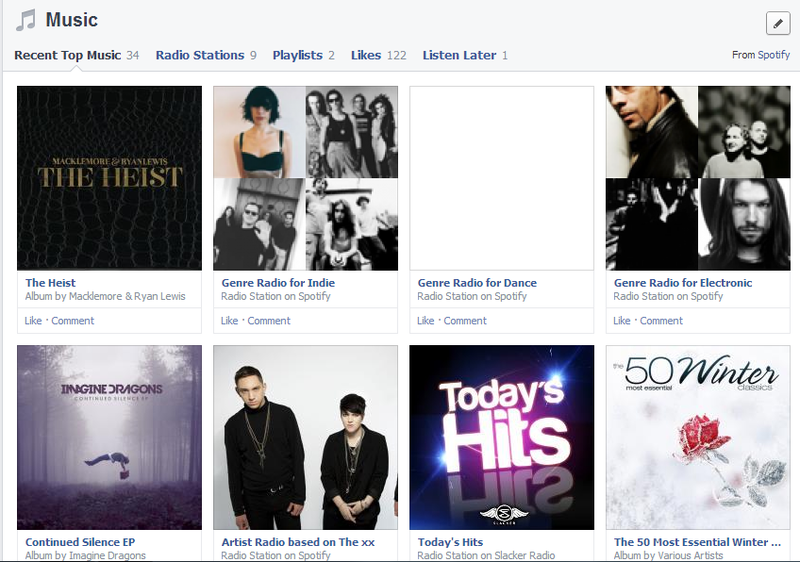 But if you connect music streaming services to this Facebook music section, it can transform the music section into a whole new music listening experience that you can access directly from your Facebook Timeline. Clicking on the link “Add music from Spotify and other apps” opens up a brand new Music section with far more options that directly reflects what you’ve listened to. The Spotify-connected Music section even pulls in Radio Stations, and playlists that I’ve listened to as you can see in the screen shot above that you can revisit through Facebook. So, word of caution here. Be careful of connecting your Spotify account to this Facebook Music section. Everything you listen to shows up here unless you manually delete certain tracks from showing up in the first place. The likes section looks different as well. 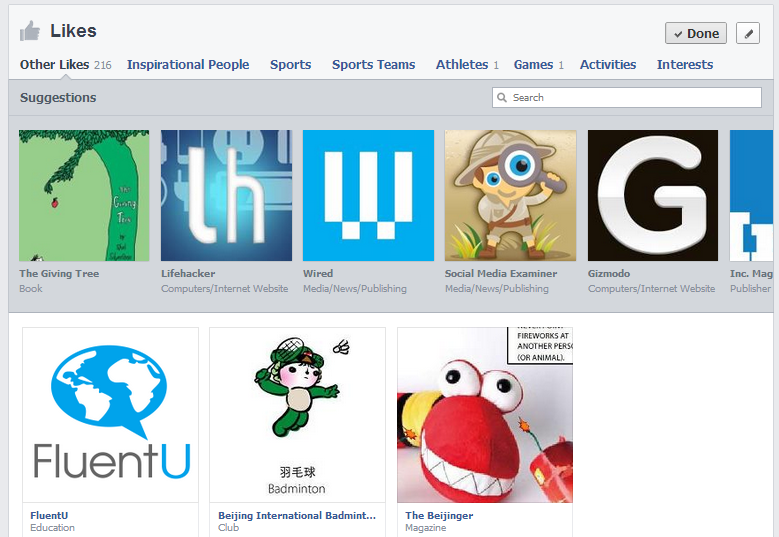 Like the other sections mentioned above, Facebook will suggest Pages that you can like based on categories of pages that belong to Inspirational People, Sports, Sport Teams, Athletes, and even Activities. We’re getting the sense that the meaning of a “like” doesn’t hold as much value as it used to. Our look under the hood may affirm our observation since we noticed that Likes were actually named “favorites” and also the fact that “Interests” has its own tab. In addition to what we’ve mentioned above, there’s one detail worth noting. What we can guess here is that that the social network is looking to add airing times to movies and TV shows and display this information to users. We think the most significant upgrade with the new Timeline is the media-integrated Open Graph actions, and there are few reasons for why Facebook might pay more attention to these media modules. Liking something doesn’t mean that it’s a direct reflection of your interests. These days the like button just really indicates that you’re following a Facebook page, whether you’ve been asked to by friends or you liked a page to win a prize. So to better gauge user interests, Facebook’s “want,” “watch,” “read” and other Open Graph actions should better reflect its user’s desires and activities. In turn by getting a better sense of what we’re actually watching and reading, Facebook can serve users better targeted ads (and inevitably boost ad revenue) and improve Open Graph search results. It could even be that these TV and movie modules have something to do with targeting video ads when that rumored feature surfaces on Facebook. What this means for “Likes” is that it’s the start of its demise to become a repository of Facebook Pages we’ve essentially bookmarked or interacted with in the past, but may not hold any weight as something we’re interested in.